The types of soil found in North American gardens can be classified as either sandy soil, loam or clay, according to the University of Florida. Most gardeners generally prize loam over the other two soil types because most vegetable and ornamental plants and shrubs grow best in it. Clay soil has distinct characteristics that can help you recognize when you have this type of dirt in your backyard. 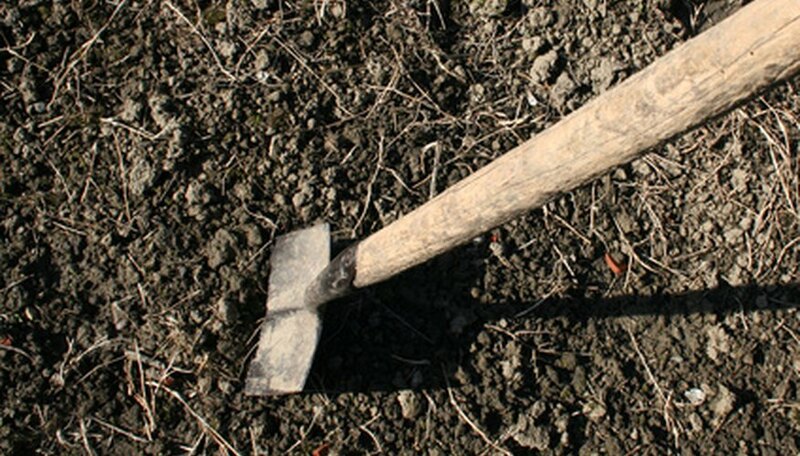 Clay soil has the finest texture compared to all other types of soil, according to the University of Florida. This generally makes it sticky and moist to the touch when it's wet, and hard and lumpy when it's dry. Clay soil's fine particles create a high-density mass, according to West Virginia University, and reduce the depth of water penetration. For example, an inch of water applied at the surface may only moisten the clay to a depth of 4 inches, according to the University of Arizona. In contrast, soil with large particle sizes, such as sandy loam, may get moistened to a depth of 1 foot. While clay soils may not allow water to penetrate as efficiently as sandy soils or loam, clay retains moisture much better. A cubic foot of clay holds 50 times more water than the same amount of sandy soil, according to Ohio State University. Gardens with clay-based soils thus need far less frequent irrigation than sandy gardens. Clay soil particles bind with soil minerals to create more nutrient-rich matter, according to Washington State University. On the other hand, sandy soil particles cannot bind to such nutrients, making sandy soil more nutrient-deficient. Due to both its fine particle consistency and high moisture content, clay soils allow poor air movement, according to Washington State University. This can create problems with plant roots which need more aerated soil to avoid rotting and bacterial or fungal growths. As clay soils absorb or release moisture, their particle sizes may swell or shrink. This change in volume often makes such soil poor for building on according to the University of Florida.